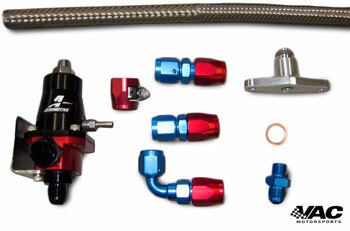 This VAC Fuel Pressure Regulator Kit includes everything you need to equip your early-model Bosch FPR on your BMW with the included modern, accurate, and robust Aeromotive FPR. Regulating fuel pressure accurately at the rail is crucial for fine tuning and eliminating A/F ratio issues across the rev range- especially if your running high compression or running large amounts of boost. The BMW factory FPRs when in working order function quite well, but when higher output or better atomization is needed from injectors, a performance FPR can help tune modded vehicles. This is a highly useful upgrade for the forced induction or very hard tuned vehicles. This is not a rising-rate FPR and is not intended for installing items such as turbochargers without antiquate ECU tuning. Fuel pressure regulators should be used to fine tune the output of injectors, not for gross changes in A/F ratios.